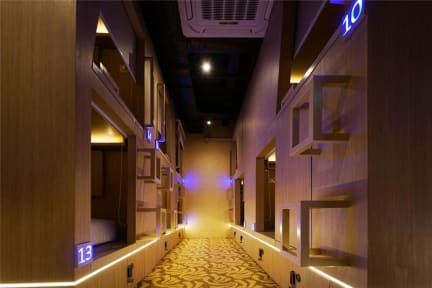 Choose CUBE Boutique Capsule Hotel at Kampong Glam for a not-to-be-missed capsule hotel experience you can only find in Singapore. We combine favourite hotel features and amenities, the friendly atmosphere of a connected community, and a capsule sleep experience that is bucket-list worthy-- all at surprisingly wallet-friendly rates. 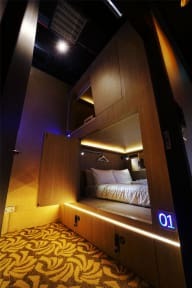 Be the best you you can be while in Singapore: Enjoy great sleep, spot-on advice from our hotel staff on what you should do, see and eat, and the ideal mix of complimentary amenities that lets you spend your travel dollars where it matters- on creating amazing travel memories. Welcome to CUBE! Conveniently located in the heart of Kampong Glam, directly in front of Sultan Masjid Mosque, our hotel provides easy access to Singapore’s key cultural and historic tourist attractions, great restaurants of all kinds (including the on-site Japanese restaurant, Yasu Grill), and is just a short ride away by MRT from popular destinations such as the Singapore Indoor Stadium, Suntec, and Gardens by the Bay. Just a few minutes’ walk from Bugis MRT station- you can really step out of our doors, straight into the action. When you’re done exploring, enjoy relaxing in our common areas to chill out in the breakfast room, or be part of the Kampong Glam scene at the front of our hotel. Our relaxed communal vibe make CUBE the perfect place to meet new friends.